The Vango Venom 225 down sleeping bag is a 2-3 season, mummy shaped bag, weighing just 750 grams. Ideal for those summer trekking trips, so how did it perform? With a weight of just 750 grams, this is the lightest bag I have personally ever used. It fits in to your rucksac easily and you can immediately notice the difference from the normal synthetic bags! This is a down bag so its filled with goose down, in fact 90% Goose down, 10% feather, with and insulation 600 fill power. The sleeping bag is basically stitched into panels and the down inserted. Because of the rating and weight, the down isn’t as packed in quite as tight, in fact if you look up to the light you can see where it moves around somewhat. This can allow cold spots in the bag, but this is the balance between weight, size and warmth! The shell and lining are made from nylon, and stitched in panels. Nylon is great because it durable, fast drying and breathable. Ideal for the kind of use you would use this bag for. I did get this bag wet from condensation inside of the tent and it protected me from getting wet inside. It did dry quickly too, essential for a more comfortable camping trip. This sleeping bag feels well constructed, strong and well designed in general. The only thing I didn’t like about the construction was the stitching. The warmest sleeping bags have the panels stitched in an overlapping design to avoid cold spots, this has the normal stitched panels. The Venom 225 is a narrow mummy shaped bag, which is an efficient shape temperature wise, but doesn’t allow as much room for movement. Always a bit of dilemma, lots of movement, or more efficient. Although saying that, I found it fine when using it and I am about average height and build. Side zips The side zip on this bag goes down as far waist height, which is as far as it really needs to go, so pretty practical really. Another weight saving aspect too! The zip itself feels tough and well secured to the sleeping bag. The hood is a very simple design as you would expect from such a lightweight bag, but it has a very handy drawcord for tightening up around the face to keep the cold air out. This came in handy on one trip, and allowed me to change the temperature inside the bag pretty dramatically. Once packed away this sleeping bag goes down to 18 X 14cm, and will fit in to any bay and some pockets of bags easily. When travelling light, size and weight are all important and Vango have done well with this bag design to get it to pack so small. The Venom 225 has a temperature rating of 4 to 25 degrees C. So that basically means it will be comfortably warm between these temperatures, but can also be used if wearing other layers in colder weather too. If your using this in conjunction with a bivy bag, again this will increase the temperature rating. Amazing really for such a thin sleeping bag! Two loops on the bottom of the sleeping bag allow you to hang it up to dry, great if the night gets damp! This sleeping bag has a RRP of £120, but you can buy them online for around £90, making them a little more affordable. 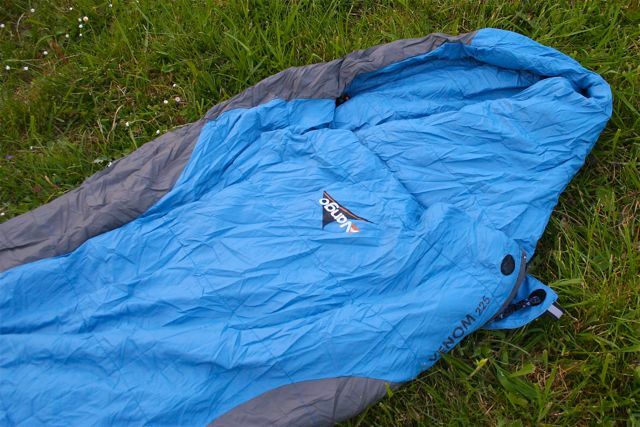 For a down sleeping bag of this quality and build, its a reasonable price! Conclusion This sort of lightweight sleeping bag is always a very delicate balance between being lightweight and being comfortable. This comes down to clever design, losing some of the luxury parts of the bag and instead concentrating on warmth and practicality. This Venom 225 is ideal for using in the warmer months and a little either way with added layers, especially good when weight makes a huge difference. I often sleep in the back of my estate car when on the banks of the river Severn, and this sleeping bag is perfect.